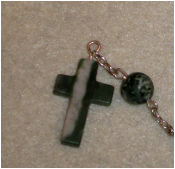 Handcrafted angel of Balance Rosary made from 8mm Tree Agate beads. Blessed to empower the healing properties the gemstones. Tree Agate is a protection stone as are all Agates. Brings balance between modern life and nature. Tree Agate is a "centering" gemstone that provides for communication and finding peace with the earth. Tree agate is the gem of introspection. It helps the wearer with more clarity and see the world through a broader viewpoint. Brings the message that the universe will provide by increasing ones ability to manifest while letting go of materialism. Tree Agate is useful for Skin eruptions, Skeletal disorders, and Capillaries/veins.